This painting was developed from a photograph in which the fence started at the bottom right and lead in to the picture toward the left. I started painting it this way but it felt wrong. My eye instinctively reads from left to right and so eventually flipped the photograph and repainted the picture. If anybody happens to take a walk along the Kommetjie coast toward the Slankop Lighthouse they will see what I mean. Hi Carol, you have really mastered perspective here, the fence really leads the eye in to the picture and on to the lighthouse. Well done! I love the rocks balancing on the wooden posts, they really catch the eye! You really sweated over this one and it's turned out really well. 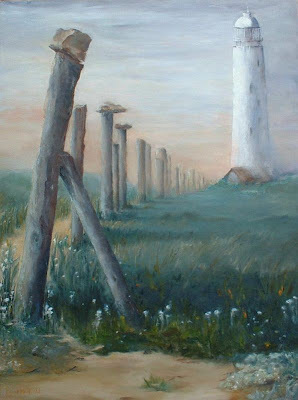 Your fence draws the eye perfectly to the distance and so to the lighthouse. Great stuff! Love the flowers in the front. Thanks Di, it is easier the second time around:) The rocks were probably put there by cubs or boy scouts. They use that technique as a direction finder. Thank you and yes Liz, it was not easy, especially all that green! and you know how I feel about green ! I just love it! from Ann in Calgary. Thank you Ann - great to hear from you!